After my first visit to Cornwall three years ago I try and keep at least one weekend per year free to take a trip down to this beautiful part of the country. This was my fourth trip to Cornwall, and there is still so much left to explore. For those of you who have read my previous reviews you will know I have a huge love for food and drink, and I was sure to find many delicious Cornish treats during my stay. On previous trips to Cornwall I have stayed on the north coast, but this time I had planned to stay on the south coast, just outside St Austell. Steak is not the first thing that springs to mind when you think of Cornwall, however I can tell you there is an absolutely stunning place to buy steaks in Launceston, called Philip Warren Butchers. Philip Warren Butchers dry age and mature their meat on the bone in the traditional way, and are also specialists in extreme aged steak. Most of us have tried the 28 day aged steaks, which you can find pretty much anywhere these days, but at Philip Warren you can get steaks which have been aged even longer, for an even better taste. In their shop they sell stunning 45 day aged steaks, but to restaurants they also supply steak which has been aged even longer, for a far more extreme taste. I bought some of their 45 day aged steaks and I was not disappointed, they were delicious. Philip Warren don’t just have a shop in the town centre, they also have a large shop located just seconds off the A30 (the main road into Cornwall). Although I do prefer a glass of wine, I am partial now and again to a chilled glass of cider. My personal preference is scrumpy and vintage ciders, as opposed to all the flavoured ciders that are readily available. As the West Country is famous for its ciders, in particular its scrumpy, I decided that a trip to a cider farm was definitely on my to-do list. I visited a place a few miles from Truro called Healey’s Cornish Cyder Farm. The cider farm’s facilities were much larger than I had imagined. I had imagined just a small farm with a shop where you would be able to taste some of the ciders before purchasing, but this was not the case! Healey’s was very well established, with a wide range of facilities such as a café/ restaurant, two large shops, a visitor’s centre, tasting room, and a Jam Kitchen. They also offer tours of the farm, with prices starting at £4 for the most basic tour, to £15 if you want to see the complete works. 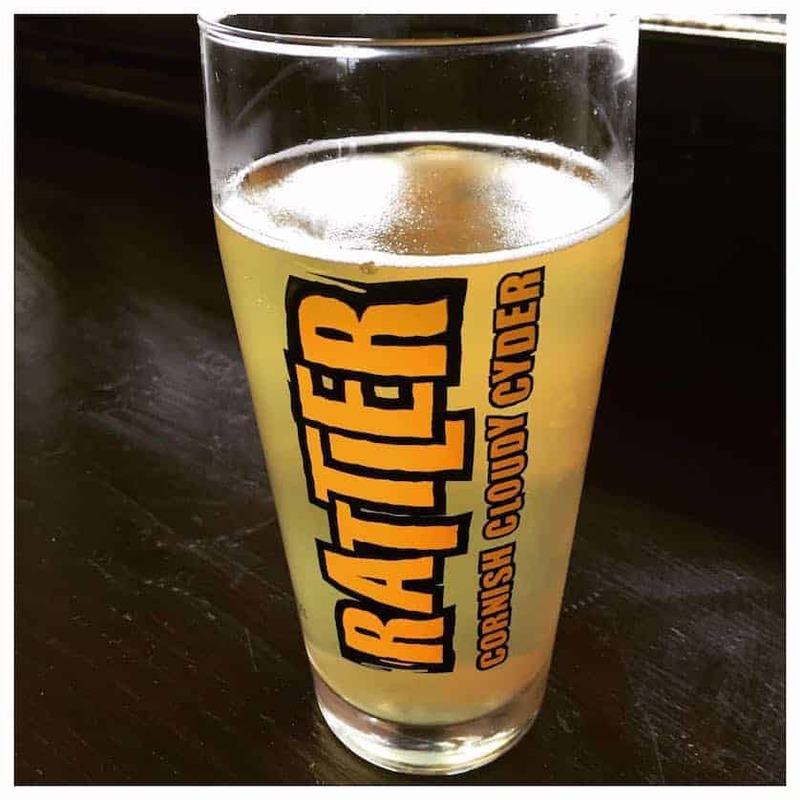 From cider infused in old oak barrels which previously housed rum and whiskey, to their Scrumpy and their renowned ‘Rattler’ – available in original, pear, mixed berry and their lower alcohol 4% Rattler. All of these were great, but my favourite was the Cider infused in the rum barrels. The cider at Healey’s is extremely good quality, and it’s easy to spend quite a long time in their shop, and of course leave with many yummy purchases. A traditional Cornish Cream Tea was also on my to-do list, and while I was at Healey’s I noticed that they served a Cornish Cream Tea with a twist – A Cyder Farm Cream Tea. This included a pot of tea, two of their apple and cider scones, with their apple and bramble jam and Cornish clotted cream. All this for only £5.35 per person, however there is more than enough for two to share. I enjoyed this, as well as a pint of their original Rattler before heading off to explore more Cornish treats. I love nothing more than treating myself to a Cornish Pasty every now and again. I have a few local bakeries near my home that make lovely ones, but there is nothing better than a traditional Pasty while I am on a trip to Cornwall. I decided I wanted to find a really good one, and while I was visiting Looe I found a place called the Cornish Bakehouse. The Cornish Bakehouse cooks fresh pasties daily with a choice of 14 fillings, in 4 different sizes. I often try different fillings, but while in Cornwall it just had to be a large traditional pasty. It was a great tasting pasty, absolutely packed full of filling and made with a beautiful pastry. You definitely won’t go wrong with a pasty from The Cornish Bakehouse. Un Week-end Merveilleux à Bruxelles!